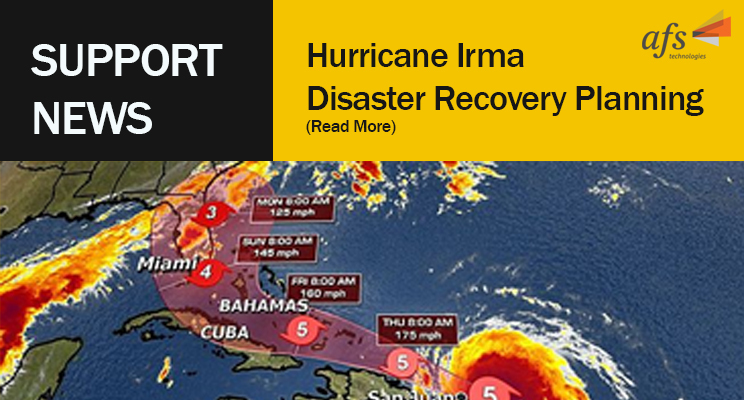 AFS Support teams are reaching out to customers in the path of Hurricane Irma. We share your concern and want to make sure you are as prepared as possible to protect your valuable business data in the event of a direct hit. As your partner, we want to work with you through any issues around your disaster recovery planning. If you feel you have gaps in your planning to protect your data, please let us know? If you have concerns, contact AFS Support at 877-821-3007 or +1-602-522-8282.